Moving offices can be a bit of a nightmare. It either means doing it over a weekend and hoping that everything works when the staff arrive on Monday morning, or disrupting a working day (or two) while the business is ‘in transit’. One of the things we do for clients is to help them move their IT facilities. Recently we actually moved our own office and having all the IT connections sorted out meant it was really trouble free. What the standard broadband speed is for the building (uploading and downloading). They probably won’t know, but stay on their case until they find out. If you’re used to a high speed and find your new office is half as efficient it can have a big impact on your business. 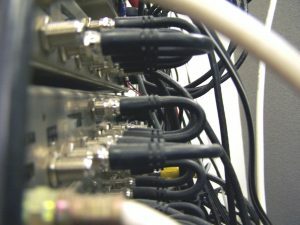 What cabling it installed for IT networks and, if you have standard landline phones, where the connections are to plug in your equipment. Make a plan for where all your existing equipment will go – use a tape measure – don’t guess. Even if you’re moving to a bigger office, there’s nothing worse than arriving with a van full of kit and finding something doesn’t fit where you thought it would. Don’t order your broadband to be connected on the day you move in. Engineers won’t be able to work with furniture being moved around them. Discuss access prior to your moving date for connecting up your broadband so you can move in and simply plug everything in. If you’re worrying about signing the lease and then having the premises empty (and some overlap with your old location) while the technology is sorted out – consider how much more complicated it will be if you move in and find that it takes 10-14 days to get everything connected. You can get things connected quicker – usually within 2 days – but there is a premium for doing that, so it’s going to cost you more anyway. If you have VoIP telephones you can keep all your current numbers and simply plug everything in when you move. If you have standard BT lines then you’ll need to invest in call forwarding and rerouting, which, over time can be expensive. If you’re considering a move may be needed at any time in the future, consider switching to VoIP sooner rather than later.